Employees at the Department of Veterans Affairs office in Charlottetown found out that 143 position full-time positions have been deemed surplus by the federal government. DVA says those jobs will be dealt with through attrition and retirement. 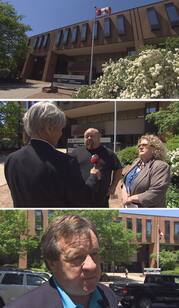 CBC's John Jeffery spoke with representatives of the Union of Veterans Affairs Employees, Jodi Lapierre and Debi Buell. Dozens of Island musicians are getting some extra exposure these days... taking part in the CBC Searchlight Competition that's looking for Canada's best new artist. Compass VJ Steve Bruce met up with a few of the PEI hopefuls - Rachel Beck Colwill and her sister Amy, Colour Code, and Ten Strings and a Goat Skin. Afternoon Radio Host Karen Mair is giving the contestants plenty of air time. They've all posted an original recording on the CBC Radio website that Canadians can listen to and vote for each day. Besides offering exposure to thousands of bands across the country, one lucky act will win career-boosting prizes, including $20,000 in music equipment. The first round of Searchlight voting has begun.